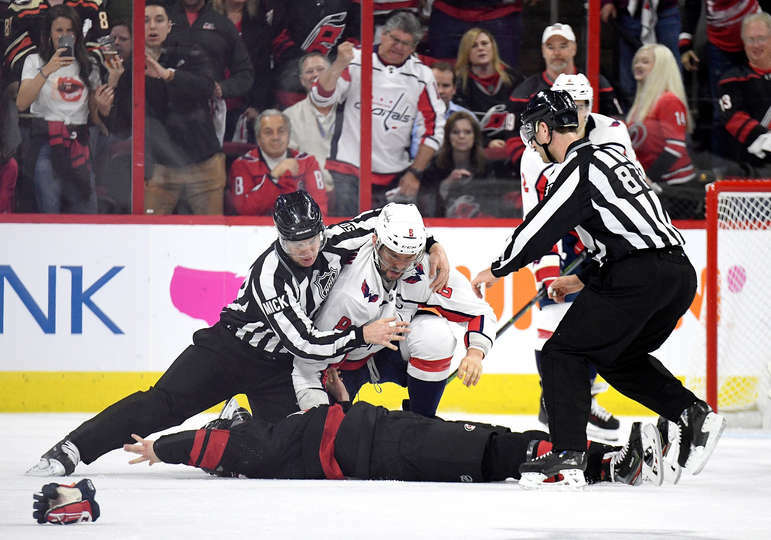 Game 3 of the Capitals’ first round playoff series against the Carolina Hurricanes may be one period old, but tempers have already flared after the Hurricanes took a 1-0 lead. Gloves were dropped…but by perhaps the least likeliest of players. With the Hurricanes controlling play in the Capitals’ defensive zone, Carolina star rookie Andrei Svechnikov gave Capitals captain Alex Ovechkin a few quick whacks with his stick and his elder countryman countered. After a brief conversation, the two Russian stars dropped the mitts, and the contest was nowhere near close. The Caps’ captain (who had one goal and two assists coming into Game 3) pummeled Svechnikov with about three roundhouse rights before Svechnikov was dropped to the ice, clearly dazed after three fists to the face and his head hitting the ice. The 2018 first-round pick had to be assisted off the ice with the help of team medical staff. Ovechkin and Svechnikov were both given five-minute majors, with Ovechkin icing his right hand while serving his time in the sin bin. This entry was posted in Games, News, NHL, Players, Playoffs, Teams, Washington Capitals and tagged 2019 Stanley Cup Playoffs, Alex Ovechkin, Andrei Svechnikov, Carolina Hurricanes, Fight, Game 3, Michael Fleetwood, Washington Capitals. Bookmark the permalink. Maybe one of the worst physical and non shooting contest all year and during the playoffs. Extremely disappointed by the teams effort after Ovies tko! Absolutely deplorable back on their heels afterwards defensively confused on their coverages and a step slower being beat to the puck by the Canes. And Carolina played with two less offensive players for most of the game. Kudos to the Carolina Hurricanes a job well done!